Folks ask why I have three different names. It’s because I have three different publishers! While each series stands on its own, as a reader of traditional mysteries myself, I love knowing what else my favorite authors write. 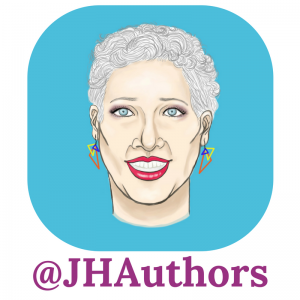 Learn more about Julia Henry, J.A. Hennrikus and Julianne Holmes here! My new Kensington series, the Garden Squad series, debuts in 2019 with Pruning the Dead. Lilly Jayne is a widow who lives in Goosebush, Massachusetts. Along with her friends Tamara O’Connor, Ernie Johnson, and Delia Greenway, the Garden Squad decides to take some gardening issues into their own hands rather than go through the tangle of rules and regulations that an overzealous town clerk has put in place. When Lilly’s first husband is accused of killing his wife, they add sleuthing to the gardening mix. I love writing this series, with the multi-generational protagonists, wonderful location, and tremendous crop of plot ideas. Added to this mix is the opportunity to ask friends and family for their gardening tips. As J.A. Hennrikus I write the Theater Cop series for Midnight Ink. Sully Sullivan is an ex-cop who lost her career and marriage at the same time. She decided to move home and change things up, so now she runs the Cliffside Theater Company in Trevorton, Massachusetts. Little did Sully know she’d need to dust off her sleuthing skills, but when her friend is accused of killing his father, she does just that in A Christmas Peril. The Cliffside Theater Company is doing their annual version of A Christmas Carol. The next in the series , With A Kiss I Die, is coming out on April 8, 2019. Sully has gone to Boston to be a sounding board for Dimitri. He’s taken over a troubled production of Romeo and Juliet. When Sully’s ex-husband is accused of killing Mimi Cunningham and then disappears, Sully is on the case. As Julianne Holmes I wrote the Clock Shop Mystery Series for Berkley Prime Crime. What a thrill–a dream come true. Just Killing Time came out in October 2015, and was nominated for an Agatha for Best First Novel. Clock and Dagger was released on August 2, 2016. Chime and Punishment was released August 1, 2017. I hope you enjoy meeting Ruth Clagan and following her adventures as much as I like writing them. When I had to chose a name to write the Clock Shop Mystery series under, it was a simple choice. I was the first grandchild on my mother’s side of the family. When my parents told my grandmother that they were thinking about naming me Julianne Holmes Hennrikus, my grandmother (a wonderful but formidable woman) told them the name was too long. I became Julie Anne instead. So Julianne Holmes is close to my heart, pays homage to my wonderful parents, and can be shortened to Julie easily. As J.A. Hennrikus, my short story, “Tag, You’re Dead” was published in Level Best Book’s anthology Thin Ice. “Her Wish” is in Dead Calm. And “The Pendulum Swings, Until It Doesn’t” was published in Blood Moon. I am one of many authors who had their publishing debut via Level Best Books, and am forever grateful to the editors. Sign Up For My Author Newsletter Here! In 2018 I am opening an online arts administration school for artists, called Your Ladders. This new business venture combines over 30 years of working in the arts with my passion for teaching. I blog with the wonderful Wicked Authors blog. These woman are my friends, my blog mates, and my cheering squad. Come by and visit us!